Ever since Ken Onion formed a relationship and collaborated with Kershaw on their knives they have been releasing some amazing peices. 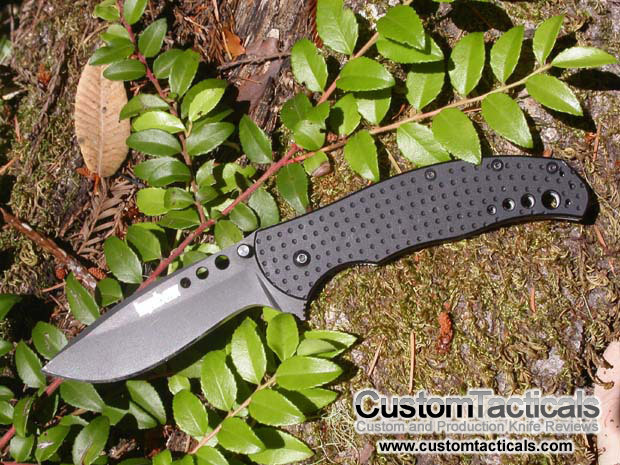 The Boa is among around a dozen knives designed by Ken Onion for Kershaw, which include the Steven Segal folder. This knife has the Speed-Safe Torsion bar mechanism that Kershaw and Ken Onion Developed, and was the first knife to add the Index Finger Trigger for easy opening. I love the trigger.. It is much safer-feeling than the thumbstud when opening the speed-safe mechanism. For those that don’t know, the speedsafe opens the knife via a torsion spring after its pushed open about 1/8″ or so. It snaps open pretty good after that, and a Liner Lock kicks in. One gripe i had about the trigger was that its sharp angles dug into my finger nail when i closed the knife and didn’t pull my thumb away quick enough. This didn’t happen with the rounded trigger of the newer Leek or Scallion models. The blade has a heavy recurve which is great for draw cuts and a big belly which is good for cutting meat or fleshy substances. I personally thing the knife looks great asthetically but found the blade a bit small for the handle. The pocket clip is positioned for tip down carry, but i would have liked to see a tip-up position tapped so it could be switched. All in all a very well designed knife that doesn’t need a whole lot of improvement. It is a few years old now and never updated models have improved on this then-groundbreaking design. However it is still an excellent knife that will outlast most. las cachas deberian de ser G10 pues el aluminio resbala. Sorry no hablay spanish. There is no G10 on this knife is you are asking? If my articles are in ENGLISH, why are you speaking to me in SPANISH??? ?